WINDMILL ANIMAL HOSPITAL is excited to offer our clients Companion Laser Therapy. Laser therapy provides a non-invasive, pain-free, surgery-free, drug-free treatment which is used to treat a variety of conditions and can be performed in conjunction with existing treatment protocols. Relief of pain and/or improvement is often noticed within hours, depending on the condition and your pet's unique health status. Whether your pet is rehabilitating from trauma or injury, healing from wounds, or simply aging, your companion can benefit from this innovative approach to treating pain. Laser therapy stimulates the body to heal from within. Non-thermal photons of light are administered to the body for about 3 to 8 minutes, and are absorbed by the injured cells. The cells are then stimulated by the energy provided by the photons, and respond with a higher rate of metabolism. This results in relief from pain, increased circulation, reduced inflammation, and an acceleration of the healing process. 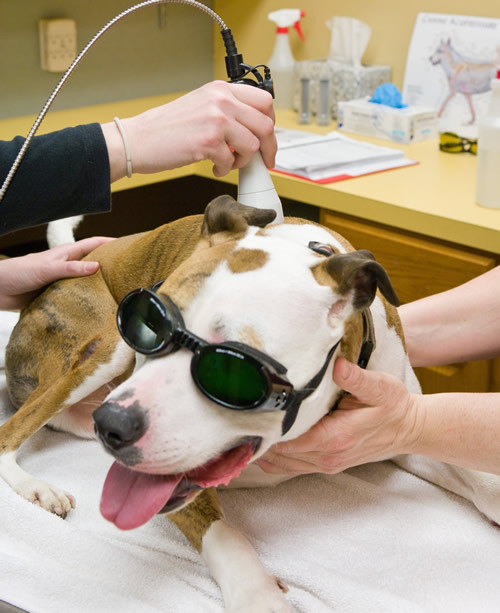 Laser therapy helps the pet get better, faster. Simply put, it provides relief. 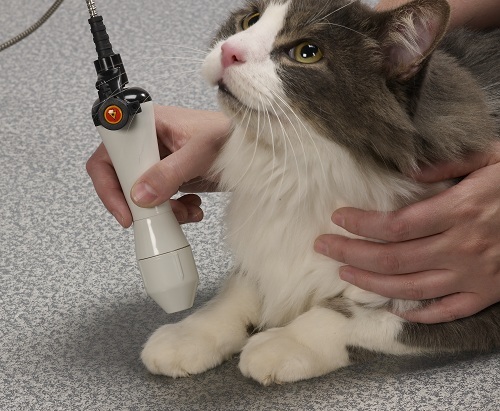 As the laser is administered, your pet will relax and enjoy the treatment. The almost immediate relief of pain will allow your pet to be comfortable and any anxiety that your pet initially experiences will dissipate. Occasionally, angry cats will start to purr, and dogs will actually fall asleep during their therapy session. Frequently, after therapy, we hear: "He's acting like a puppy again" or "She can actually jump onto the chair again." Pain relief is provided in just a few minutes of therapy, and that alone improves the quality of life for your pet. Contact Windmill Animal Hospital today to schedule an appointment or obtain additional information. Dr. Price, and Vet Tech Ruthie prepare to give "Mattie"
Matt Torres of KTAB films and interviews for his news story. to tooth aches to ear infections! With Matt Torres on the live television show KTAB 4 U!